Call for a free estimate. 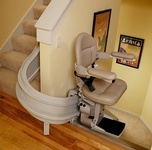 Bruno can custom build a Stairlift to fit amount any situation. The Bruno Elite Curved stair lift delivers an unmatched smooth, quiet ride from start to finish. With Bruno's signature stair lift, the quality and comfort are second to none. 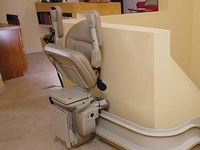 Add power options to further customize your Elite curved chair lift to fit your lifestyle. Unit is attached to the Floor.